Motherboard is nick name of the main circuit board of the computer that resides in the system unit. Motherboard is made of a hard plastic on which metallic circuits are etched and various components are fixed on their proper places provided on the motherboard. All the main components are fixed on the motherboard and directly connected to the main circuit. Microprocessor Chip, RAM chip, Display adaptor card and sound card etc. are either fixed or in-built on the motherboard. The external devices like printer and monitor are also connected to the motherboard through a connector or an adapter card. 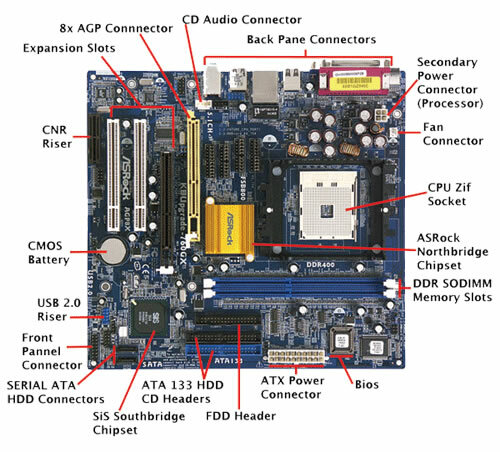 The place where the devices are connected on the motherboard is known as computer Motherboard. A motherboard isn’t made of plastic, it’s fiberglass.